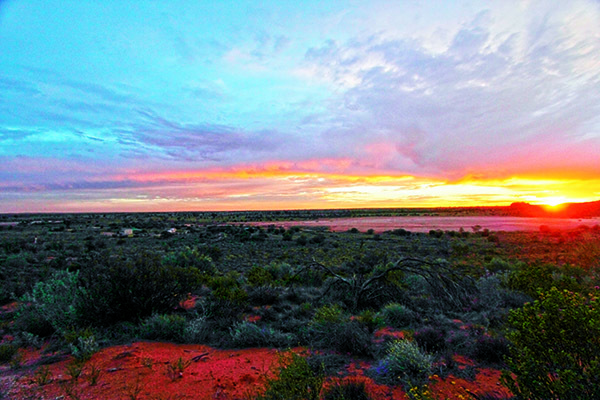 After almost a week in outback South Australia we had really got the taste for this spectacular inland environment – from the Gawler Ranges and Lake Gairdner to The Breakaways near Coober Pedy and The Painted Desert on Arckaringa Station. We still had a few days to kill and quite a way to go before we were due to rendezvous with some 4WDing buddies in Alice Springs, so we looked at our maps for a likely waypoint for a bush camp. From Arckaringa, there were two possible routes that would both lead to some beauties – west to Oodnadatta then north through Witjira National Park to Chambers Pillar; or straight up the Stuart Highway with an overnighter in Erldunda to Rainbow Valley. It was a tough choice but, for reasons too numerous to mention, the valley won out and we are so glad it did. 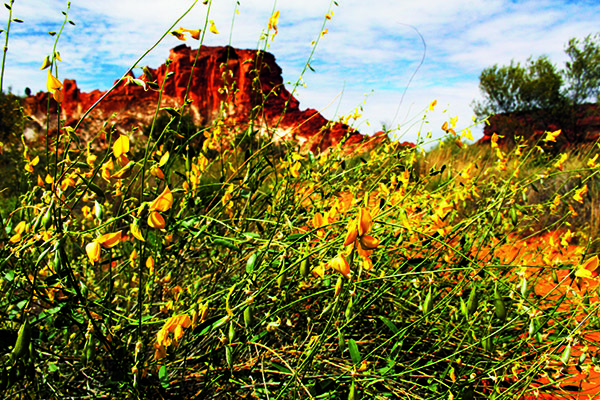 The Rainbow Valley Conservation Reserve, 97km south of Alice Springs, is renowned for the spectacular coloured banding of its sandstone cliffs and bluffs, part of the James Range, and the massive, spired outcrop known as Rainbow Rock (Ewerre) that dominates the surrounding orange-red landscape of sand dunes and claypans. 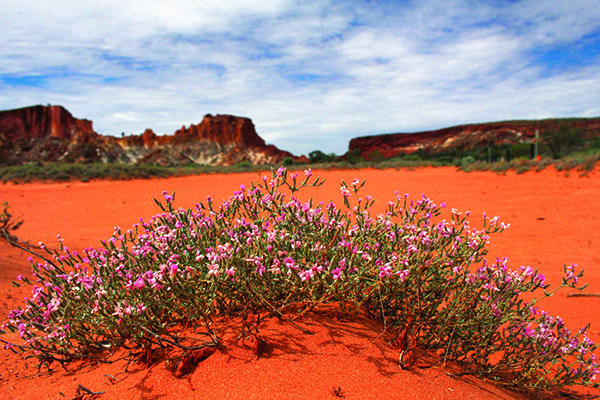 The valley lies in the traditional country of the Southern Arrernte Aboriginal people who know this place as Wurre, a bush tucker dreaming site and an important place for meeting and ceremony. Found throughout the area, especially around the hills and ridges, are artefacts of their ancient connection with the country, in the form of rock engravings (petroglyphs) and paintings, grinding stones and stone tool chips. Ewerre is a registered sacred site. The significance of the spread of black rocks at the northern base of this rock formation is not clear, but the traditional owners insist that these rocks should not be moved. 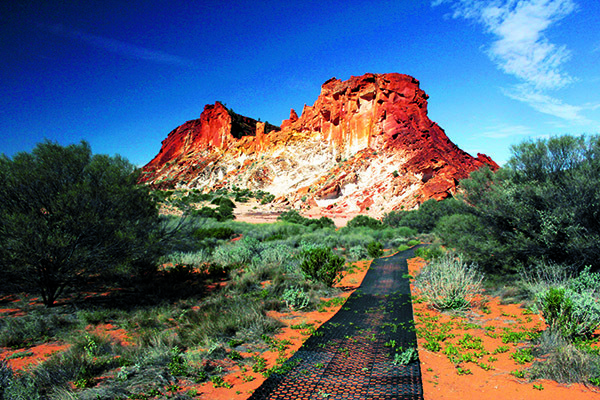 The park takes its European name from the coloured rock bands in the sandstone cliffs created when red and yellow iron oxides were dissolved in ancient, wetter times and drawn upwards through layers to the surface during dry seasons. The minerals formed a dark red iron crust with the softer yellow and white substrata weathering more quickly into loose sand. Erosion has also carved huge blocks from these startling sandstone formations leaving sheer faces, jagged crags and scree slopes in hues of crimson, orange, cream and bone white that fairly glow at dawn and dusk. The overcast morning was fast clearing to a brilliant blue day as we claimed our site at the camp. In truth, it was little more than a large space in the carpark but it was handy to the amenities that included picnic shelters, gas barbecues, fire pits and flush toilets, and we had the whole place to ourselves with a clear view of Ewerre from our front door. As soon as we had set up our Kimberley Karavan, nicknamed Tikay, we set off along the walking trails to explore the neighbourhood. 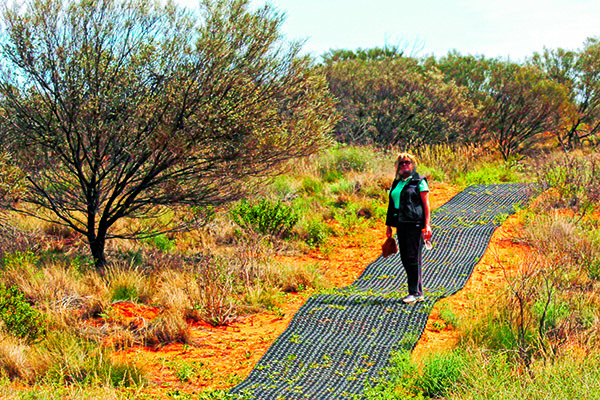 In keeping with its status as a conservation reserve, great pains had been taken (in the form of cordoned bollards and rubber mat footpaths) to protect the fragile environment from unnecessary pedestrian traffic and to promote the generation of a myriad plant species. At first sight, the scrubby vegetation covering the dunes appeared bland and nondescript, barely rising above head height. However, as we strolled along the formed pathways, we were astounded to find scores of wildflowers and blooms of every colour gracing the plants and shrubs. Later, we rummaged through our onboard library for a copy of Wildflowers and Plants of Inland Australia to identify this host of colourful strangers with such odd names as hairy goodenia, umbrella bush, rattlepod and foxtail. We spent an enthralling hour or so meandering through this desert wonderland of sculpted cliffs and botanical gems before returning to Tikay for a quiet lunch looking across the claypan to Ewerre. The clamourous activity and attendant clouds of dust (too much even for the flies) abated in late afternoon, allowing us the opportunity to climb back up to the observation decks atop the sandy ridges for a sunset spectacle to rival anything we had seen at the Breakaways or Arckaringa. Several other campers had arrived by then and were also out and about enjoying the sights and sounds of this now peaceful camp in a multi-hued sea of light. That night the Milky Way and all the constellations of the southern sky sparkled overhead, lighting up the landscape and adding an eerie glow to the stunning rock formations around us. 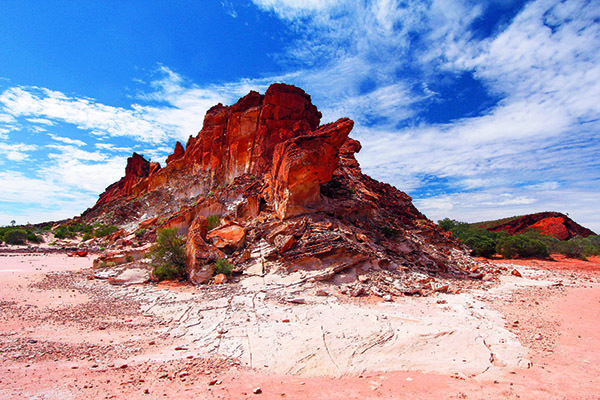 Rainbow Valley is 97km south of Alice Springs. 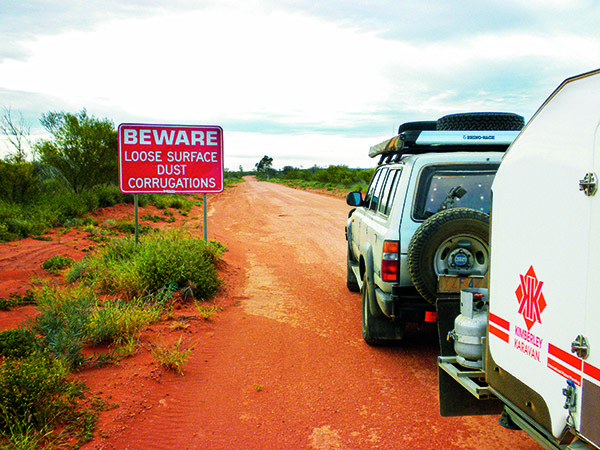 A 22km unsealed road leads from the Stuart Highway to the reserve’s carpark and campsites. The road has corrugations, sandy patches and washouts and can close when wet. The reserve is accessible all year, but the cooler months of April to September are the most pleasant. Visit the Alice Springs Visitor Information Centre at Corner of Todd Mall and Parsons Street, Alice Springs, NT and phone (08) 8952 5800 for more. Camper trailer camping is accessible by 4WD only and available next to the carpark for the Ewerre viewing area and walking tracks. First in best dressed. Fees are payable on site.